Peter Keegan is an award-winning artist living and working in Buckinghamshire, UK. Working at his studio within the grounds of The National Trust’s Claydon House estate, Peter paints predominantly in oils, following traditional techniques but using them in a way to depict his subjects in a modern and original style. His aim in portraiture is to always create a painting or drawing that reflects the subject's likeness and personality, as well as capturing those special elements which make the subject truly "them". 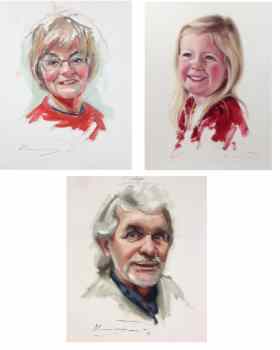 Peter will both demonstrate and guide you through his approach to capturing a portrait in either oils or acrylics – looking at how to start the portrait, mixing flesh colours and getting a likeness. As well as plenty of one-on-one tutoring and guidance, time will be given for relaxed, informal, group critiques to help our understanding and enjoyment of painting and the genre of portraiture. Peter intends for all his workshops to be engaging, productive and enjoyable, helping everyone produce work they are very happy with, regardless of their ability. These are the colours Peter will be using however participants are welcome to bring any colours they have. a good range of brushes. Peter uses thick, hog-bristle filbert brushes. Any shape hog brush will be fine. No soft/sable brushes please. Peter will be using canvas (oil or acrylic) paper. Please bring at least 1 board /canvas/canvas paper to work on, approx 50x40cm, already primed/protected, or a few sheets of Oil or Acrylic paper. *I would recommend that people use a standing or table top easel and not work flat or sitting down. This is of course if people are happy and able to do so. Each participant should also have their own table space to keep their materials and work on. If printing your own image, please make sure it is printed on A4 paper with the subject filling the page as much as possible (i.e. no unnecessary background details).